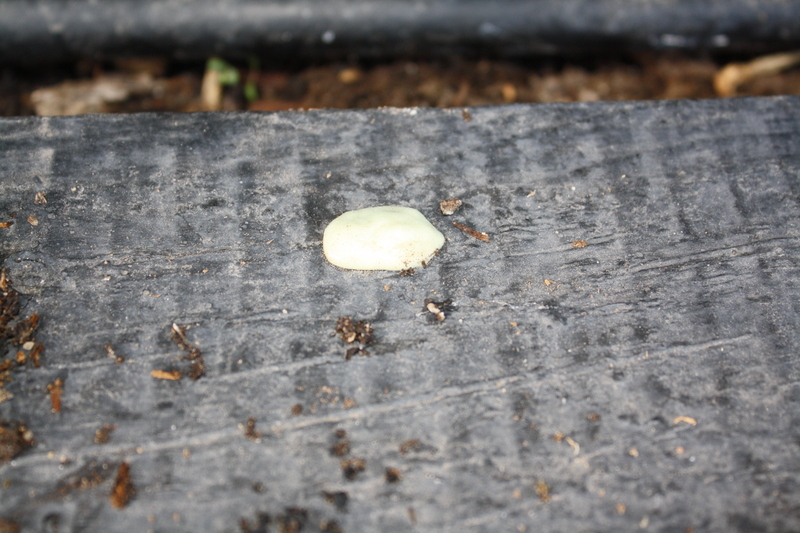 You are currently browsing the category archive for the ‘Gross Stuff I’ve found in Plants’ category. 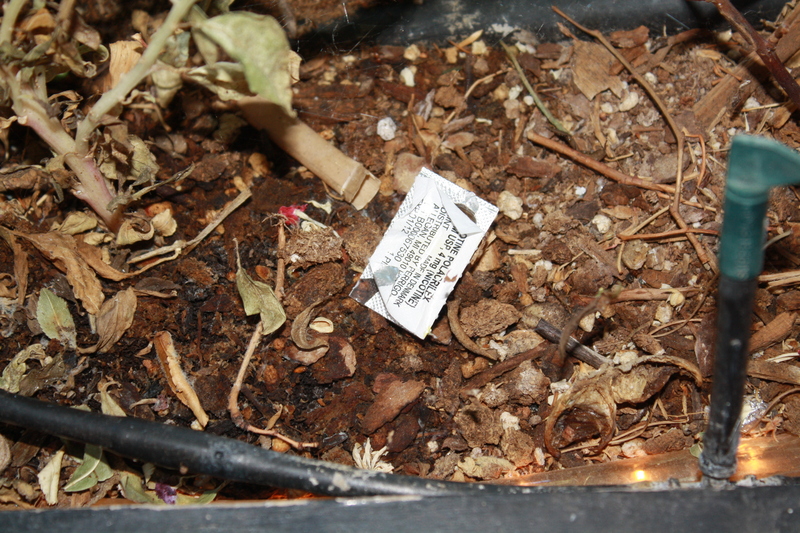 I didn’t plant it there, but I’m not going to yank it. The managers enjoy it, and I think the bar customers must, too, because last year, someone drew jack o’lantern faces on the fruits. There are fruits on this plant, but so far no faces. We’ll see if that changes as we get closer to Halloween. I don’t see how or why that was necessary, but there you have it. 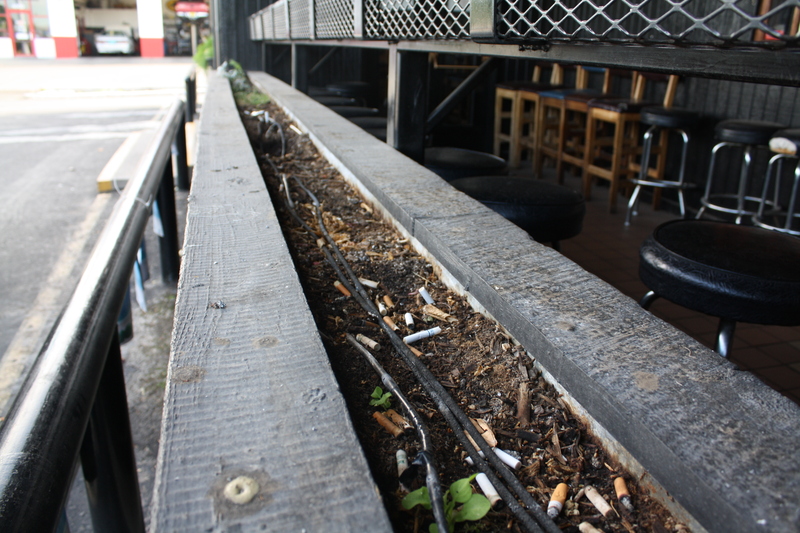 If you’d like to put food or trash in one of the planters yourself, please visit Billy’s Long Bar, on San Mateo just north of Montgomery, soon. Try planting lemons or limes – I’d love to see a citrus tree grow in those planters. On behalf of plant lovers, gardeners and decent human beings everywhere, I implore you – don’t be a jerkface and use planters as trashcans. La la la…la la la…la la la. That’s not too gross, right? Riiiiiiiiight. Haha! 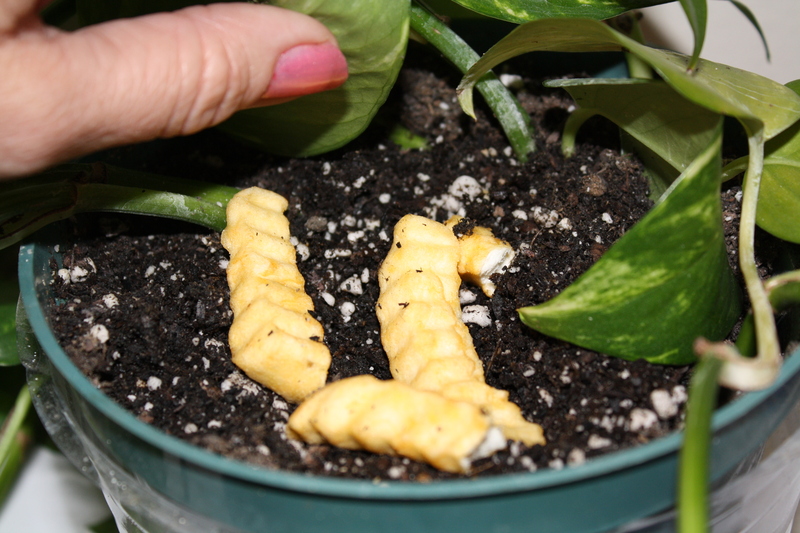 I know it’s supposed to be a houseplant blog, but sometimes I just can’t resist¹. People make it too easy! ¹You’re welcome for only posting two of the dozens of photos I took of this puke. Hi oreos, and happy Wednesday! Dried fruit shows up almost as often as gum. Straws aren’t really gross, as far as I’m concerned. 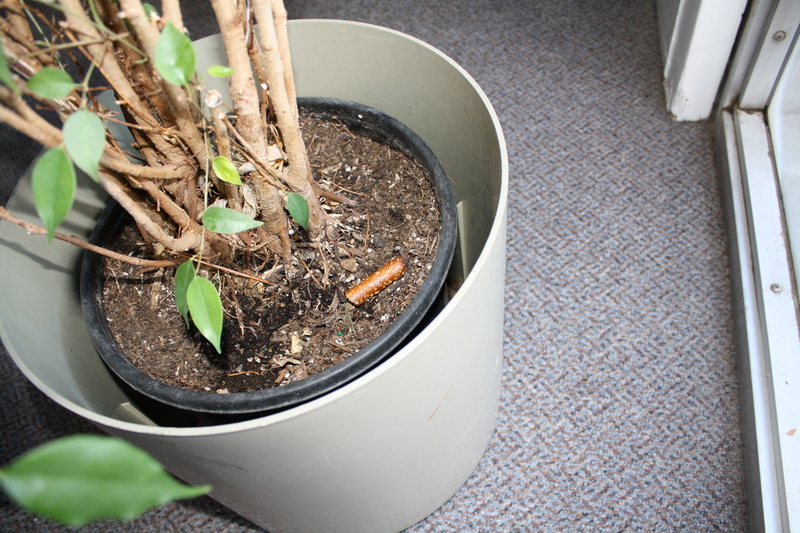 But the human who used this planter as a trashcan is probably pretty gross. Haha, this isn’t really gross either, but it made me laugh when I found it. A piece of plastic. From what, I have no idea. Drunk people are, well, drunk. Really, any trash in the planters is going to be kinda gross, even if it’s just a wrapper, because it’s not supposed to be there. And someone knew that, but put it there anyway. Sigh. Some people. 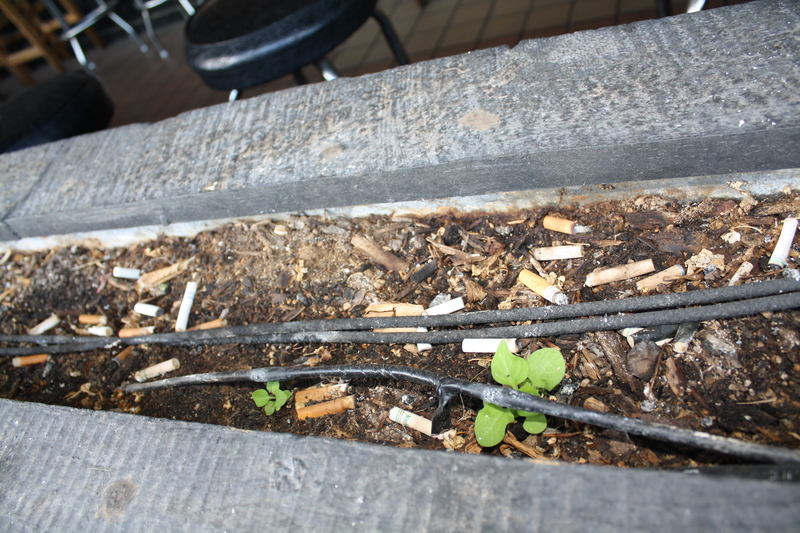 I’ve used a couple of these photos before, because the majority of trash I find in the planters are cigarettes. 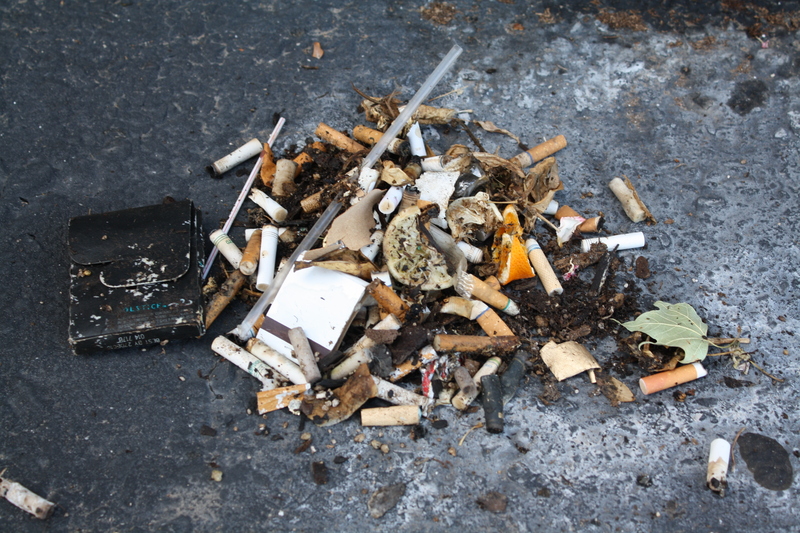 I don’t know why smokers don’t think butts are trash. 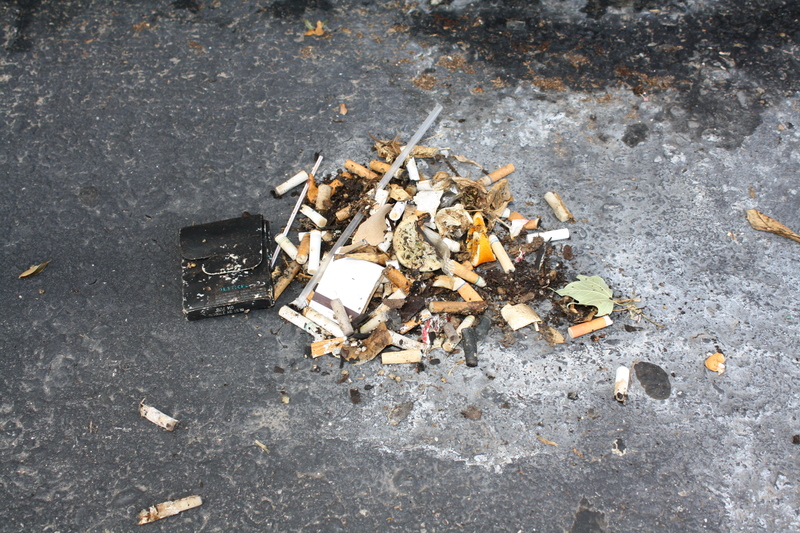 Some of the most intelligent people I know won’t think twice about throwing their cigarette out the car window. It’s weird. I mean, they really are smart, and otherwise very nice people. 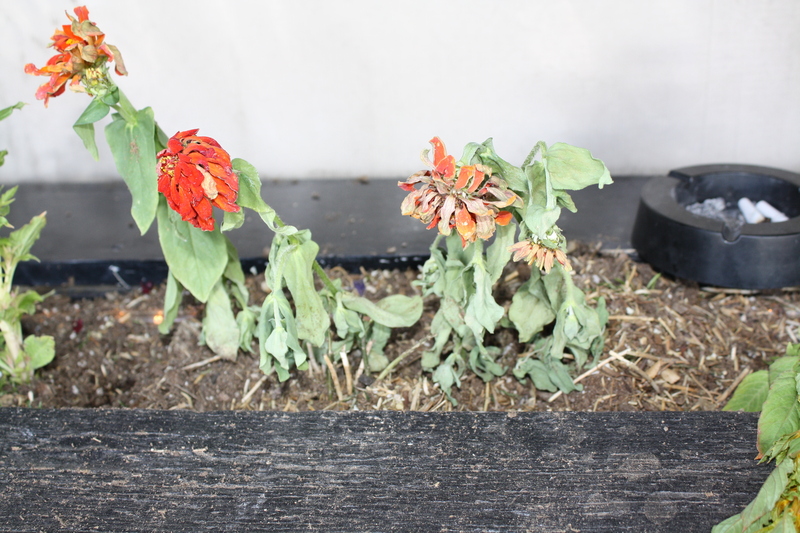 Looks like the Zinnias aren’t fans of the cigarettes, either. Haha, see ya manana! Hi pepperoni slices, and happy Wednesday. 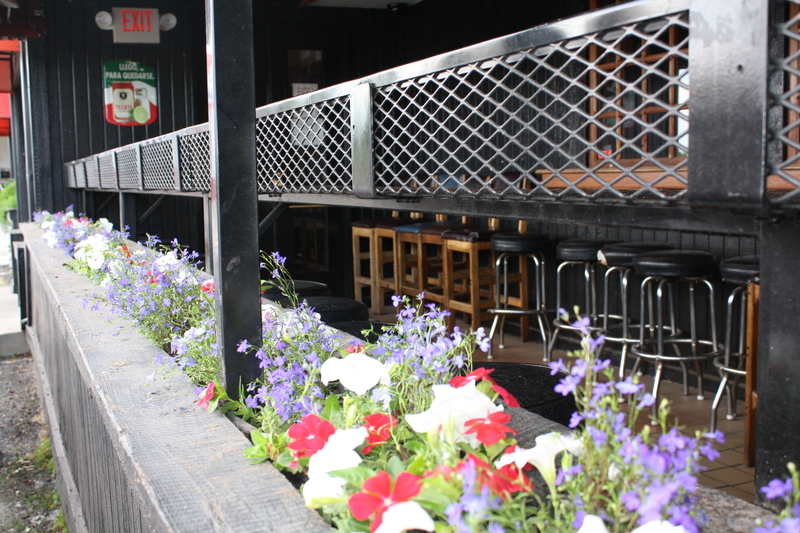 Just for the fun of it, I recently planted an empty planter at Billy’s Long Bar with red, white and blue flowers. These flowers will be here growing and thriving until around October or November. Will people still want to see red, white and blue in November, I wondered to myself. Then I thought, of course they will. They’re still planted in America no matter what time of year it is. I keep hearing about how we are a divided America. Segregated like these plants in the back of my van, seemingly unable to see the value in each others’ being. I understand, yes, there are lots of differing opinions out there, and lots of people like to shout their opinions in your face, lots of people are jerks, lots of people are incendiary. But that doesn’t automatically translate to a divided nation. Most reasonable people are able to have different opinions than the people in their lives, be it coworkers, family, friends, and still get along. That’s not the same as divided. I can’t stop thinking of all the things we do together. Like ignore the World Cup (haha, I’m watching!). And worry over our oceans and lands. And wonder what life will be like for our grandchildren. We’re a nation that likes music and the arts, gardening, and drinking on patios. Minor league baseball games (Go Isotopes! ), movies, cars, animals, tweets and dinner parties. We love to laugh and dance, we’re not afraid of hard work. We can be smart, we can be smart-asses, we can be asses. We cling to hope to see us through each day. It’d be cool if we had some sort of holiday where we could come together as a nation and stop calling ourselves divided before we actually become divided. Maybe celebrate by, I don’t know, blowing things up and eating hot dogs by the pool? I think the best way to express national pride is by having local pride. 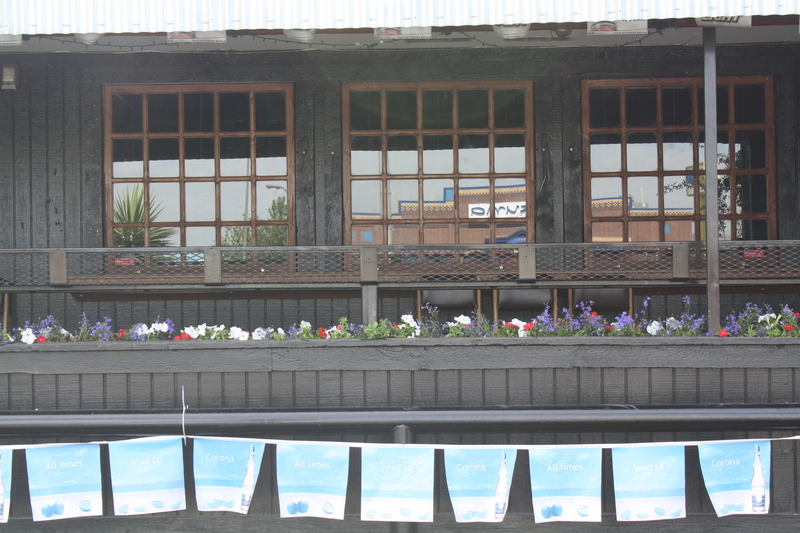 I want customers to look at those flowers and think, “Hey, that’s nice.” Gardeners do this with their gardens. Businesses do it with their services. Restaurants do it with their cuisine. It’s all about having pride, nationally and locally. Pride in our values, pride in our careers, pride in our neighborhoods. And changing aspects of our lives we don’t like. It’s our choice, individually, yet collectively, too. It’s almost our birthday. I wonder, will this be the year we grow up a little and stop doing things to harm ourselves? The year we gain forward momentum rather being mired in the past? The year we discover the value and the pitfalls of personal freedom, and how that impacts our collective freedom? If I were the one blowing out the birthday candles on America’s cake, I would wish for action. By that I mean individuals and businesses taking responsibility for their screw-ups, and fixing them instead of hoping that positive thinking will solve all the world’s problems. Action, meaning working toward solutions rather than bickering about the problems. Action, doing what’s right for all of us, rather than what’s easy or good for only some. I’ll be back manana. Until then, happy gardening! ¹ Including the plant selection. 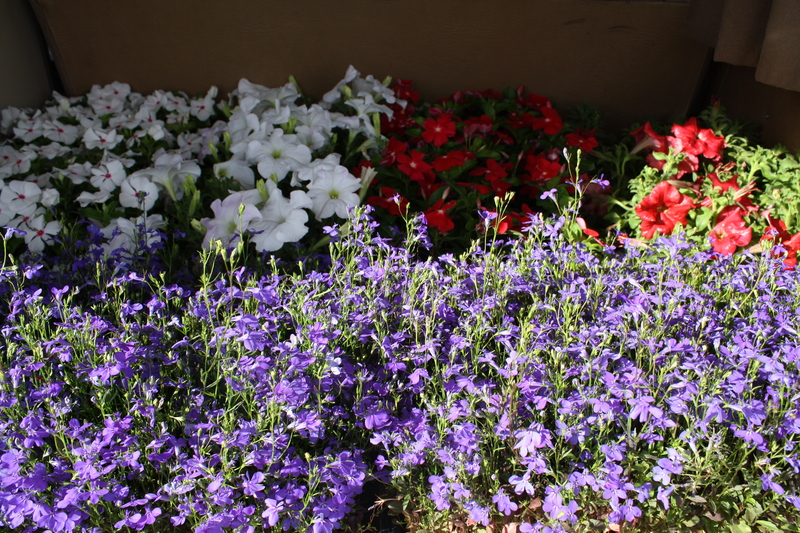 I would’ve chosen more Petunias, maybe even thrown in some purple ones, but there was not much selection at Corrales Road greenhouse. They will be shutting down the business on September 1st. They are giving up – the big box stores have worn them out. It’s currently for sale in case, you know, you have some extra money and you were thinking of buying a plant nursery anyway. I’m gonna miss this greenhouse, and it’s great people including Ann, Chris and Mike. 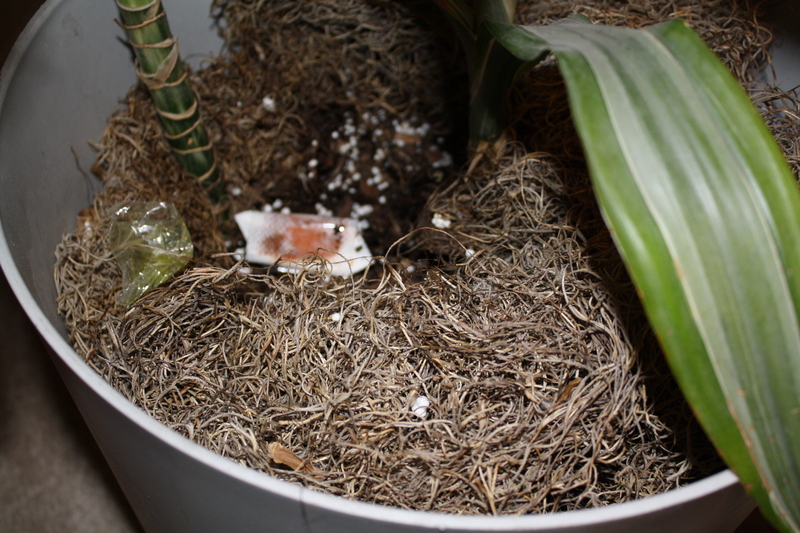 I’m planning on helping them out as much as I can between now and then, finding new homes for the plants. 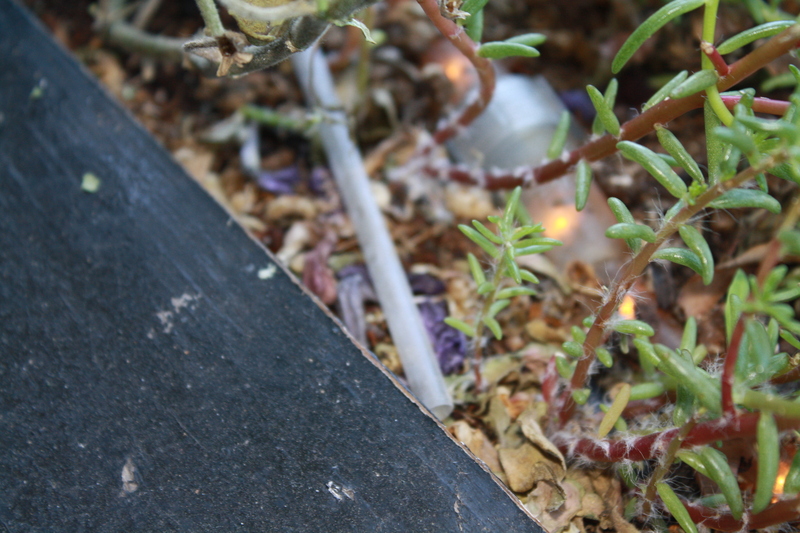 Step One: View plants as trashcans and not magical, living, breathing creatures. Hello all my radishes out there in the world, and Happy Wednesday! Hope today finds you well! As most of you know, I have a small plant care business, Good to Grow, here in Albuquerque. There are lots of perks to being a plant lady. For one, it’s fun to eavesdrop on other people’s office politics, and then get to leave without being affected by them. Also, plants don’t talk back. Another perk is that I have a flexible schedule – as long as I visit each client once a week, it doesn’t really matter when I’m there. The biggest downside of caring for plants is having to deal with the humans who thoughtlessly and carelessly interfere with my work. 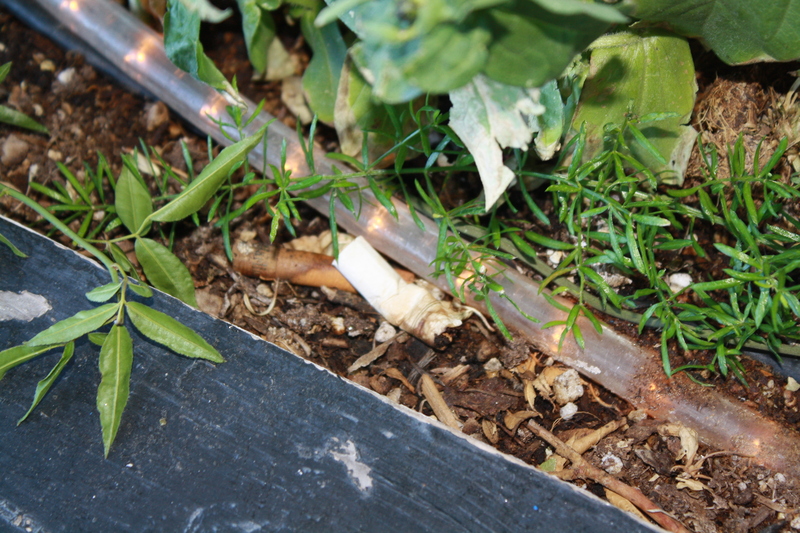 The most common problem is that people use plants as trashcans. It’s true! Littering is my number one pet peeve as it is, and this is littering indoors. It really gets my leaves furled! 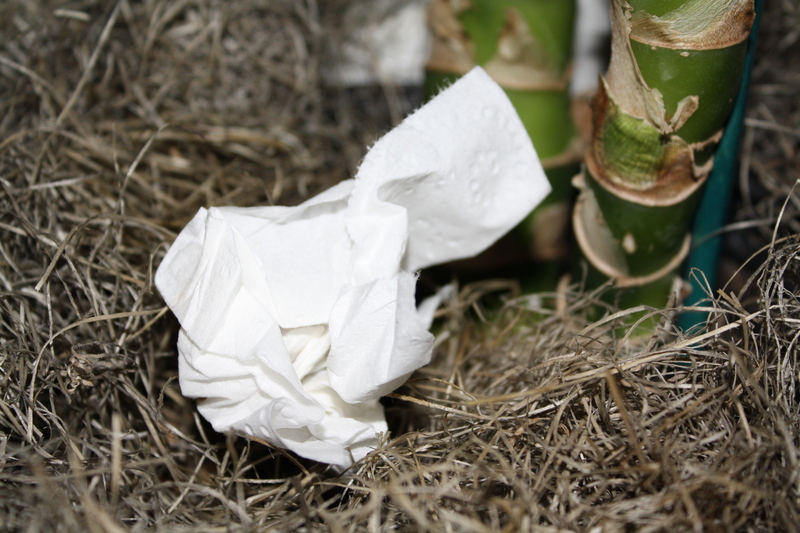 Gum, tissues, food, crayons, wrappers, plastic, bandages, soda cans – if it’s small and meant for the trash, I’ve probably seen it in a plant container. It’s not just that it looks bad – it can also be dangerous. At one of the car dealerships I had as a client, the salesmen would throw razors into the plants when they were done using them to scrape stickers off car windows. Luckily, I knew they did this and was always very careful. I carry scissors with me everywhere so I don’t actually have to touch any of the trash I find, and believe me, I sterilize the crap out of the scissors routinely. 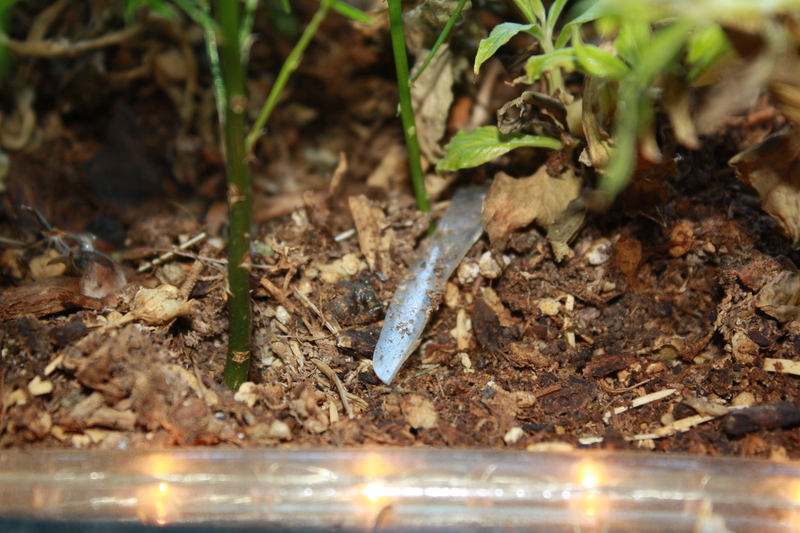 To give you an idea of how gross this indoor littering is, I’ve assembled some photos I’ve taken of some of my finds. I wish that I had carried my camera with me everywhere in the past – I missed so many great finds. But I do carry it now, so I’m going to add to this photo gallery in the future. Lucky you! Please be forewarned, some of these may bother you (most won’t, however). 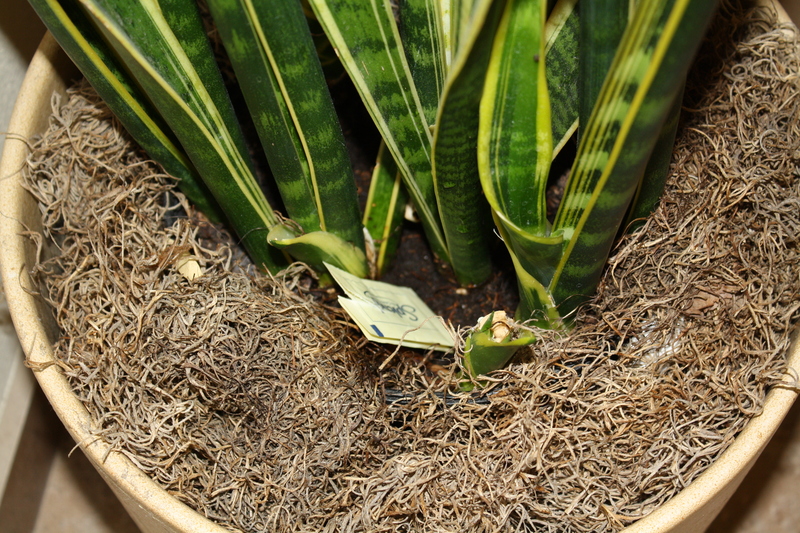 Splenda wrappers in this Snake plant. Coffee-related trash is very, very common. Sugar wrappers, empty little creamer cups, stir sticks. It kinda blows my mind because the coffee pots are in kitchens, and every kitchen I’ve ever visited has had a trash can. 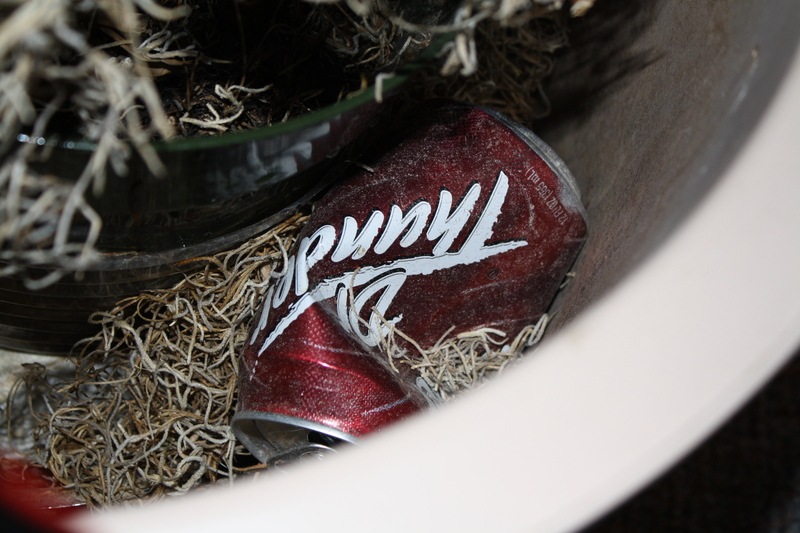 Soda can hidden below a layer of Spanish Moss. I check this plant every time I visit because it’s right outside a child therapist’s office. Often, the kid has to sit outside in the lobby while the therapist talks to the parents inside the office. A LOT of the trash I find in plants is from kids – I know this from the amount of crayons and food I’ve found over the years. I don’t get upset when I can tell a kid put the trash there – kids don’t know any better. Adults, though? They should all know better! 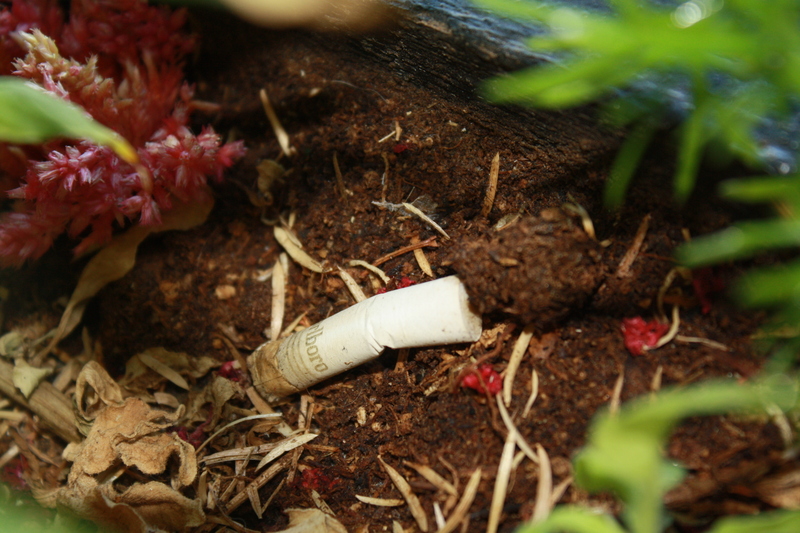 It’s not like plants can water themselves – someone is going to come along to water and find that trash! Some trash makes me laugh. 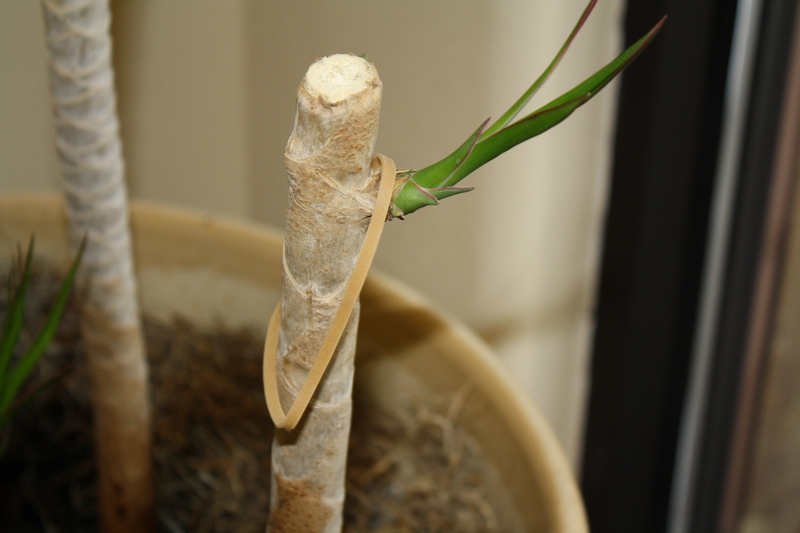 These rubber bands are evidence of an office-wide rubber band war. Very funny employees. But it’s still trash that I had to clean. 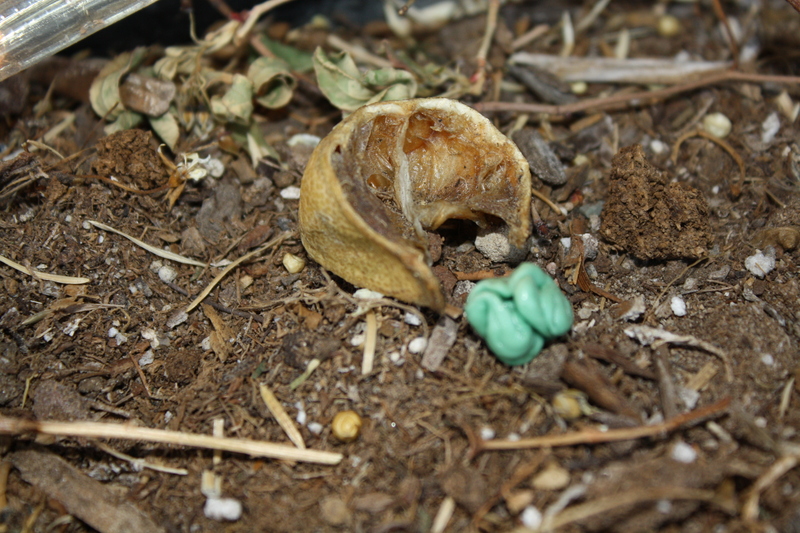 That’s a chunk of pretzel that someone felt compelled to dispose of in the soil of this Ficus tree. 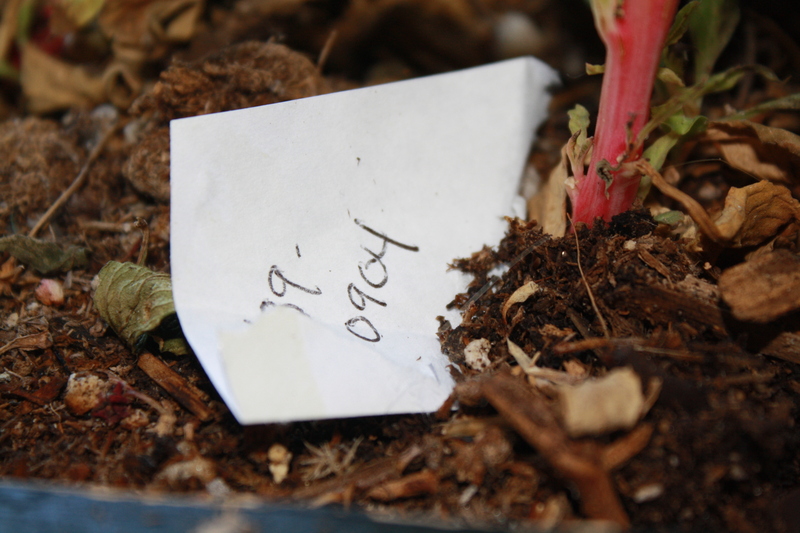 Super – I just love finding food in my plants. French fries – super duper. Ok, now is where it gets really gross. This is one of the few times I had my camera with me long ago. I was at UNM’s Cancer Center taking care of the plants. I should mention here that they let me go about 6 months ago, opting not to have plants in their brand new environmentally friendly multi-million dollar facility – the patients’ loss, and mine. I know the nurses miss me, so when I posted about my new marketing idea – an adorable basket of baby plants – I was thinking how cute they would look on their desks. Keep your fingers crossed for me that my ploy works and they hire me back! Oh, sorry, I digressed. I do that sometimes. Back to the photo. It looks innocent enough. Just a tissue, right? 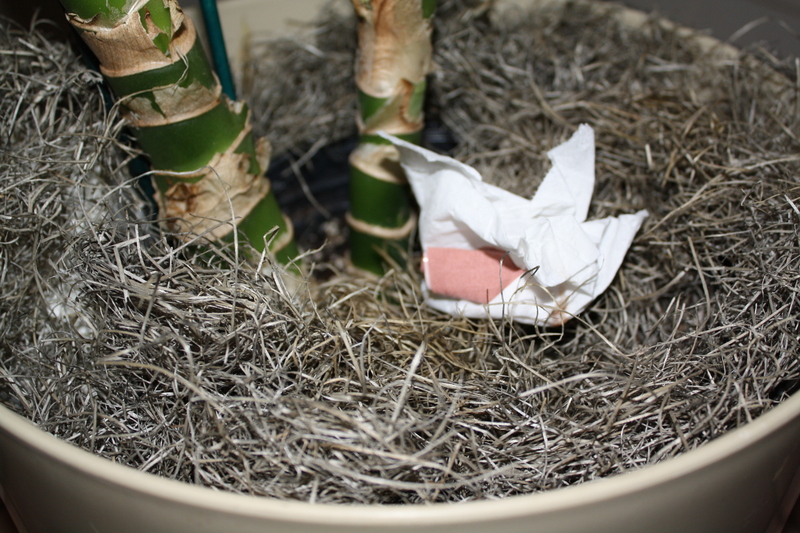 Sadly, dirty bandages in plants were not uncommon at the cancer center. 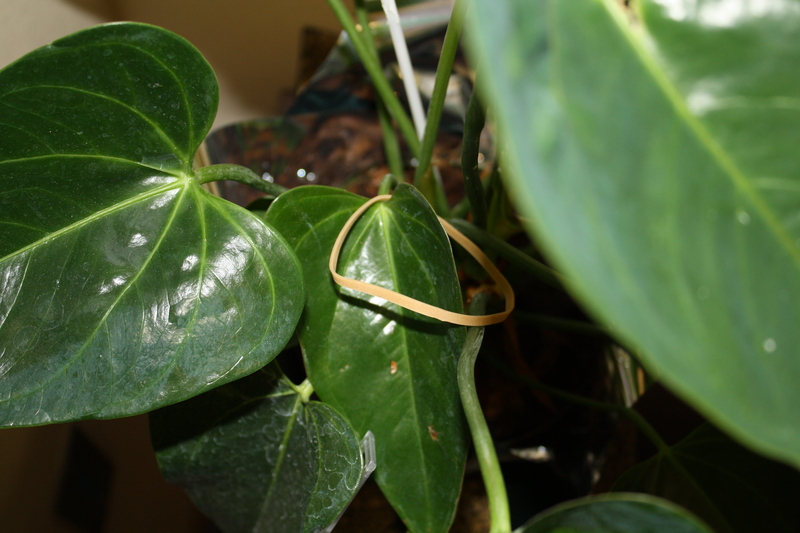 When I first started doing the plants there, I thought the patients would really love and appreciate the plants. And so many of them did. But others, well, they used them as trashcans. I am not saying any of them were terrible, rotten people – not at all! I just wish they could’ve considered the plants’ perspective. If the human had paid attention to the plant and not used it thoughtlessly as a trash can, maybe the plant would’ve said, “I would hug you if I had arms,” or “Give me the cancer so you can go on being human.” If they could talk, that is. For the record, I think plants can communicate without words if we would only listen. I know lots of us are listening, and I’d bet that anyone still reading after that gross bandage is a person who believes that even though plants can’t talk, doesn’t mean they don’t have personalities and wish they could shout for joy. I told you dirty bandages were not uncommon – you didn’t think I was going to let you get away with only one gross bandage photo, did you? Hahahahahaha. I’m drunk on power. Just think, if I win the cancer center account back, I can show you so many more dirty bandages, and other fun stuff, too, like syringes, which are also surprisingly popular. Wait, do I even want that account back? Well, the nurses were awfully sweet. That does it for today’s allotment of grossness. Thanks for reading all my green beans out there. I’ll be back tomorrow with a Plants 101 post. Until then, happy gardening everyone! ¹ To be fair, people are just trying to be nice when they make comments like that. Small talk is polite, but some people just aren’t very good at it. If you are one of these people who struggles to find the right words, try saying this, “hello.” Hello is perfect because it doesn’t generate any urges to be snarky.